Name, age, hometown: Jason Hall Herrington, 19 years old, Tampa, Fla. What corps are you in and what is your role this summer? I am in the Cavaliers color guard and I spin sabre. Give us your full drum corps/marching music background. The 2004 Cavaliers was my first summer of drum corps. I have always marched winter guard -- pretty much since I was 10 years old with East Lake High, then Countryside High, and for the past three years I have been with Northeast Independent. How did you decide to be a member of your corps? Through a friend who had marched the previous year. I never thought I would do drum corps, but I decided to take a chance and I ended up loving my summer with The Cavaliers. What first attracted you to the drum corps activity? The color guards, obviously. I had only heard stories through my friends who marched Northeast with me. I decided to see if I could make it through a summer and I just really wanted to challenge myself, so I picked the Cavaliers. What advice would you give to young people who want to march? I would say to always challenge yourself. Drum corps isn't just an activity you do to pass the time over the summer, it's full of life lessons and you'll make 150 new best friends. So don't be afraid, just go after what you want. The last good book I read: Umm, I was once forced to read "Animal Farm" and I remember liking it. The last great film I saw: I recently just bought "Closer" and "The Notebook." Where I go to school and what I'm studying: I go to St. Petersburg College and I am studying public relations. Jobs I have/have had: I work at First American Title Insurance and I teach color guard. Lots of past teaching jobs here in Florida. I also was a server, when I was real young, for a retirement resort. Three CDs I'd want on a deserted island: Norah Jones, Missy Elliot and Dave Matthews. My favorite TV show: This is tough -- there are so many. "The Nanny," "Roseanne," "America's Next Top Model" and "The Real World" would be finalists. Favorite performers: I'm not sure how to answer this -- but I am going to name my favorite color guard performers: Michael Gobiel, Tommy Allen, Adele Williamson, Amy Nettler, Stephanie DiMartino, William Martin and Matthew Richardson. How do you "blow off steam?" I spin. That sounds dorky, but it's true -- whenever I am having a bad day I can go outside and forget my problems for awhile. If I'm on tour, that's different. I spin enough on tour, so to blow off steam then I usually eat. What has been your favorite drum corps moment? 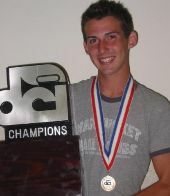 My favorite drum corps moment this past summer of 2004, was doing our victory run for everyone in Denver. Best drum corps show ever: I really liked the Cavaliers when we did "Niagra Falls." But I havn't seen to many other corps, so I'm sure I've missed a few favorites. What are you most looking forward to about the summer? Seeing my friends, starting a new show, and just performing again. Best thing about being in a drum corps: The friends you make and being able to be worry-free for three months (besides worrying about your show). Worst thing about being in a drum corps: Lack of sleep, Jeff Fiedler's voice in the morning, and sleeping on gym floors. Basically anything that has to do with not getting proper rest. During tour, the best part of the day is: Lights out. But in a close second is showering after a long day of pre-tour. During tour, the worst part of the day is: About high noon, when your skin is melting off, and you know you still have to do two runs of the show. What I want to be when I "grow up": A public relations specialist. Describe what you think a typical DCI show will look in 2015. Hmm, I think it won't be to different. Probably 200 member corps all doing shows with flying cars and lots of pyrotechnics. Feel free to add anything else you'd like. Quick shout out to all of my Cavalier friends, I love you guys and I love you, Bruno!